This afternoon, June 1, there was a small miracle at the TTC’s Greenwood Yard. Assorted politicians and transit management gathered for an announcement of transit funding, of new transit funding, and for that perpetual orphan of Toronto’s political scene, the (Downtown) Relief Line. Steven Del Duca, Ontario’s Minister of Transportation, announced that Metrolinx would be given “more than $150 million” to work with the City and the TTC on advancing planning and design for the Relief Subway Line to bring it to “shovel ready” status. This is a substantial commitment of financial support, but more importantly of political support. Del Duca was joined by Mayor John Tory in singing the Relief Line’s praises as a necessary part of growing capacity on the transit network building out from earlier improvements through GO/RER and SmartTrack. According to Chief Planner Jennifer Keesmaat (whose Twitter session is in progress as I write this), study of the RL will focus initially on Phase 1 (Danforth to downtown), but will then shift to the northern and western extensions. The northern extension is of particular importance because, according to Metrolinx demand projections, it will have a major effect in offloading demand from the Yonge Subway and the Bloor-Yonge interchange. With both the Mayor and Queen’s Park supporting the RL, and with provincial funding of the design work, the Toronto City Council gridlock over transit priorities can be “relieved” for at least a few years. The RL will not have to compete with other schemes for City funding, and with Metrolinx holding the purse, Council will not be able to divert the money to pet “relief” lines for suburban Councillors. Indeed, the whole suburbs-vs-downtown argument, which is born in part by a desire to be at the front of the line, need not pollute the RL study. The Metrolinx role is also important because the RL (aka the “Don Mills Subway” to many on this site) needs time to be presented for what it can do for suburban Toronto were it to run north at least to Sheppard & Don Mills via Thorncliffe Park. Many riders would have a completely new route to downtown comparable to the service now provided by the Spadina Subway, and this would be completely separate from the existing congested system. Capacity released on the Yonge line would be available to riders from the proposed Richmond Hill subway extension, and the reduction of transfer traffic at Bloor-Yonge could eliminate the need for an extremely expensive and complicated expansion of platform and circulation capacity there offsetting some of the Relief Line’s cost. Del Duca acknowledged the considerable work already done by the City and TTC on this file. Indeed, had it not been for the TTC’s Andy Byford with support from City Planning raising the alarm about the need for a Relief Line, nothing would have happened. 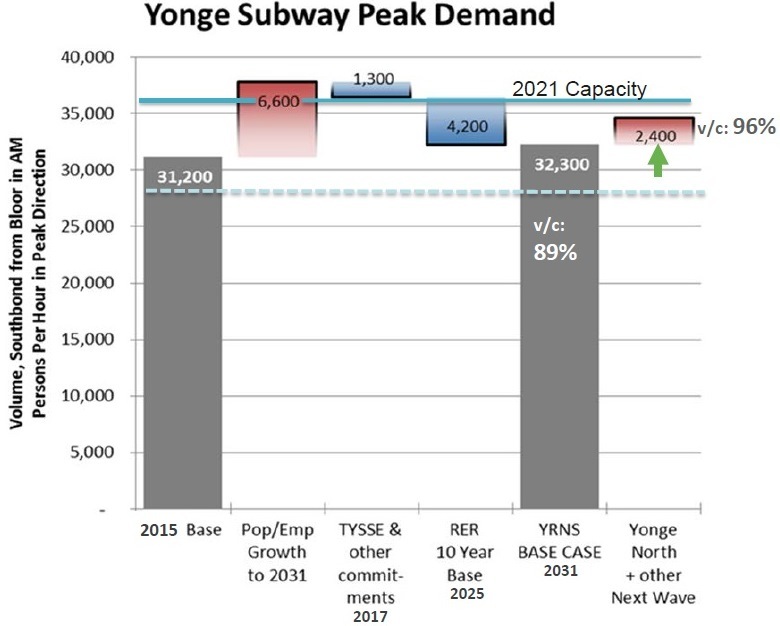 Some comparatively short term improvements will provide “relief” on the Yonge line, but these will be backfilled by pent up demand over the next decade. Smart Track may shave another small amount off of this, but notwithstanding the Mayor’s enthusiasm, the City’s own demand projections published as part of the Scarborough studies show that SmartTrack has a very small effect at Bloor-Yonge. Tory is still somewhat confused about just what Smart Track’s effect will be considering how much it has been scaled back since his election campaign. He was happy to talk about track work now in progress in Scarborough (on the Stouffville corridor) as being part of Smart Track, when in fact it is the double-tracking work for improved GO service that was in the works before he even ran for office. And he still talks of this as if it were an $8 billion project when a great deal has been lopped off of the project’s scope. Finally, the TTC CEO Andy Byford is happy just to see money coming his way from all three governments on both the capital and operating sides (although, the latter more grudgingly from the City). As for construction, that’s still some years off, and it will be important to think of the project in phases, not as one megaproject. It will take five to six years to get to “shovel ready” status, and the issue then is how quickly we want to build the line. A lot of transit capital planning lately has been hostage to constrained finances at both the City and at Queen’s Park. By the early 2020s, the Scarborough subway project should be winding down and spending can shift to the Relief Line. Now in all this excitement, if only someone would treat other orphaned projects like the Waterfront and Sheppard LRTs seriously. This entry was posted in A Grand Plan, Downtown Relief Line, Finance, Transit. Bookmark the permalink. With the most recent source being 1980, I doubt much of the data is in a usable digital form. My general qualm is that we are continually generating specific information for specific projects, but too frequently lack the centralized database of the information so that it can be useful in the future. Basically, something like OneCall for geotech data. You get individuals who become familiar with what to expect, but you don’t get a cohesive easy-to-use data set, so we keep re-inventing the wheel and designing based on assumptions only to very frequently run into unexpected ground conditions. Earlier in my life, I worked overseas in gold mining (platinum, silver, and copper being frequently in the mix as well). We had a concession area about 3.5 times the size of Toronto. Using only 3 drill rigs around the clock, within a year we built a 3D model of the strata, identified 3P resources (proven, probable, possible), and determined the extraction method and routes to minimize development costs. I agree that Queen is being fronted for more political than technical reasons, so accessible information is all the more important as a counter-factual to put the evidence in evidence-based planning. “This one just fails the sniff test. I would generally break a lines costs down into four parts (deceasing in expense): enabling infrastructure (bridges, underpasses, intersections, maintenance yards, etc); Right-of-way (rails, alignments, signals, stations, etc); equipment (vehicles, etc); and operating costs. It is entirely reasonable to consider rebuilding transit lines. Parallel lines aren’t always the best solution, or even feasible. First, RT lines don’t last forever, they have to be rebuilt some time. Technology changes. Sometimes the cost of keeping the line operational during upgrades and conversion takes place is worth the extra cost, sometimes not. The idea of a pre-metro is sound. The main concept is a tunnel in a central section big enough to take heavy rail, which often needs a smaller loading gauge than LRT anyway. Building major bridges with the future in mind can be quite prudent and passes the sniff test. Exhibit A is the Prince Edward viaduct. Building HRT-capable stations is optional, usually often left out. Despite what L. Wall says, this does not preclude them from being classified as a pre-metro. The alternative to pre-metros is more BRTs in CBDs. They have an important place, but LRT is often better. Ontario is currently building two pre-metros: The Crosstown and Confederation lines, and both are the appropriate technology choice. Steve: I would challenge the degree to which the Crosstown is a “pre-metro”. It will operate with low floor cars, while a full “subway” would be high platform. Conversion of the stations would require changing the platform height and all associated accesses notably the escalators and elevators. Possible, but not trivial. The shutdown would be over an extended period. Really, it would make more sense to design for long enough trains that similar vehicles could be used simply with an extended tunnel. In any event, it has been hard enough to get ONE line built. Prebuilding a huge piece of infrastructure — more tunnels, bigger stations, more complex transfer points — costs a lot of money for something we may never need. More capacity someday, yes, but there is no guarantee that the Don Mills to Downtown corridor would be the best place for it. Meanwhile, other much needed projects in the GTHA would go unbuilt because of our making a supposed provision for the future. If you want to talk about capacity, the limitations on the existing GO corridors are more troubling and particularly the bottleneck at Union Station. In the SmartTrack context we keep hearing about near-subway frequencies and capacities on the rail corridors, but nobody has explained how all this will actually fit on the network. Erick: When I read your response I was astonished. I did not understand it, since we are talking about a corridor which since the late 80’s has been identified as requiring something stronger than local service, so no pre building infrastructure here, it’s something that is required yesterday. But since not only it’s your site but you have forgotten more about transit than I can ever hope to learn I figured I must have missed something and should think about it before saying something else. Didn’t want to start a debate about this when in fact the debate was settled decades ago. But then all those comments from various people about « pre-metro » makes me wonder are we still talking about the relief line? In the last 10-15 years in the transit planning world, it’s becoming apparent that when you ask a line (bus, subway or LRT doesn’t matter) to do both local and regional (which is what express is about) then you do neither. The need is not sometime in the future, the need was decades ago. I understand how difficult it is to build a line but since you get one shot at this might as well make it count. The sprawl is there to stay because of economic dynamics, so will the need to service all those passengers. That part of Toronto needs both, the relief line can easily do both. The problem is always of course politicians who think only in terms of reducing capital budgets and don’t think about the operations budget. Because if you set up the relief line as a local service only you will need to run a parallel bus service which ends up being expensive and inefficient. Local service is important, but more and more people go outside their neighbourhood and the transit system needs to be able to bring them where they want to go. GO has yet to understand that it needs to run all day service and not just commuter trains despite all the noise about RER. Many of the constraints on the heavy rail infrastructure are not only because of the infrastructure (which it is) but primarily because of the North American railway operational culture. It’s always brawn over brains and frequency is a dirty word. Schedules??? Please. So yes I would love to talk about what GO should be doing but GO won’t be able to pick up the slack anyway, so relief line it is. CN and CP and GO need to learn from European railways about the proper usage of infrastructure and the need to respect the schedule, no need to go Taktfahrplan like the Swiss, just something that even the British (with all their infrastructure issues) understand would do. Also Transport Canada needs to do some serious rethinking. The Caisse de dépôts project for the Montreal area, which is essentially to take over heavy rail lines and convert them to light rail makes no sense at all, heavy rail is generally cheaper. Especially when it’s already there and only light upgrades are required. The reason they are choosing light rail is because they are allowed to write its own rule book (subject to approval of course) and Transport Canada will not be involved, it’s Transports Québec that would be the regulator and of course I expect them to be much more cooperative to the needs of the powerful Caisse de dépôts. So even if GO had an epiphany, there’s only so much they can do because of Transports Canada. My thinking ( and I suppose that I don’t share your optimism about future funding) is that once funds are released for the relief line along with the Scarborough issue, there won’t be much political appetite anyway and the much needed projects won’t be built because of that. Not because the relief line got four-tracked. Parallel lines aren’t always the best solution, or even feasible. While that statement is basically true, I would argue that parallel lines are far more often than not a better solution and are feasible. – as one radiates out from the CBD, things get spread out (hence the words ‘radiate’ and ‘radius’); concentrating transit capacity on something higher means that the catchment areas get wider and wider as one gets further from the CBT; nature does not put trunk arteries in the extremities of bodies, why are we building heavy subway lines further and further out from the CBD? It is entirely reasonable to consider rebuilding transit lines. First, RT lines don’t last forever, they have to be rebuilt some time. My point is that you almost always you’d be better off having an apple or a banana and not a banapple. For example, if “tunnel in a central section big enough to take heavy rail, which often needs a smaller loading gauge than LRT anyway” then you are building a larger tunnel for LRT than needed for HRT. The Crosstown and Confederation lines, and both are the appropriate technology choice. The Confederation line definitely wasn’t selected/designed as a pre-metro, as I was personally involved in it. You would be very hard pressed to fit any ‘alternatively sized’ vehicle in that tunnel. There was continual “value engineering” to minimize costs, such as smaller tunnels for a shallower station and shorter vertical transport. I’m very happy with the ends-up/middle-down style of LRT, but making some sort of LRT+ by limiting your design to HRT- criteria is basically throwing money at solving a problem that might be completely different in the 30-50 years for the first system to become outdated. Building major bridges with the future in mind can be quite prudent and passes the sniff test. Exhibit A is the Prince Edward viaduct. Actually, the Viaduct is a great example. It was overbuilt with the idea of running interurban rail service. 50 years later part of it was repurposed as a subway, but the Rosedale Valley section wasn’t used. GO has yet to understand that it needs to run all day service and not just commuter trains despite all the noise about RER. I have to completely disagree here. Metrolinx has methodically been removing the network bottlenecks for about a decade and it’ll be two or three more before it’s really done. Before that, GO was just renting spare time slots on private trackage. However, none of this has anything to do with building a four-track subway on Don Mills being overkill and diverting funds from other places. Are there any maps of the stations in the core to show how long and where the current Subway platforms are south of Dundas? Steve: It’s easy to figure out where the platforms are. Queen has an alternate exit at Shuter Street off of the north end of the platform. You can see where the south end is from the grates at street level from the air shafts at the south end of the platform. At King, the south end is at the Melinda Street exit, and the ventillation grates are just north of Wellington. At the north end, the grates are just north of King.